When I was a little girl my 72 year old Slovak grandmother raised my sister and I while my mother went to find herself. Beth and I would run around the house like kids do. She would yell at us not to be “gypsy girls”. I could never figure out why being a gypsy girl was a bad thing. with my friends in a caravan sounded wonderful! Thinking about it now, I think that was what my mother was. 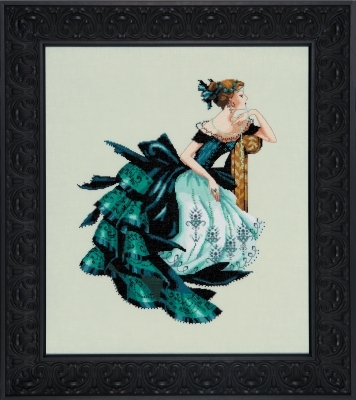 Model stitched on 32 count Milk Chocolate Linen (65-95) by Wichelt Imports. 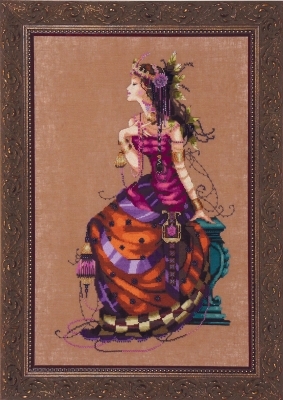 Alternate fabric 14 count Milk Chocolate Aida (357-95) by Wichelt Imports. 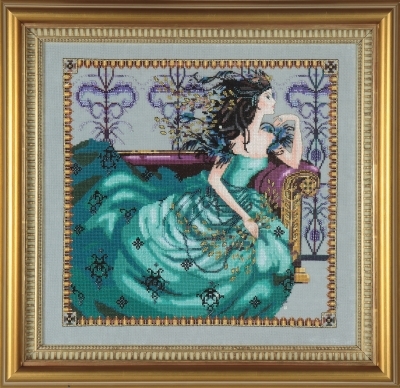 Stitched area is 10.688″ w x 17.875″ h with a stitch count of 171 x 286. Stitched 2 over 2. 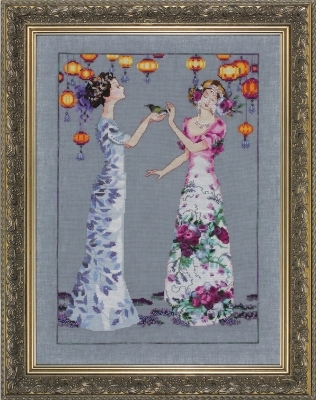 You are cordially invited to moments at dusk between friends under silk lanterns. There will be rambling gardens and much laughter. We will celebrate summer under the stars. Fairies and other winged creatures welcome! 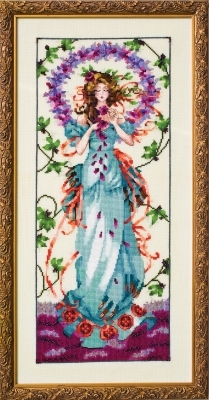 Stitched area is 11.25″ w x 16.25″ h with a stitch count of 180 x 260. Stitched 2 over 2.
otherworldly beauty frozen in the glance of a painted maiden. 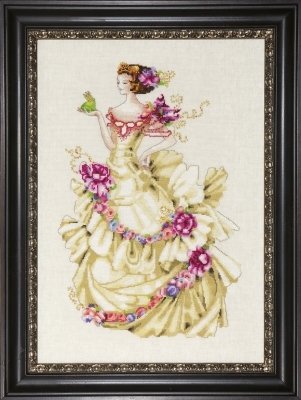 Model stitched on 32 count White Chocolate Linen (65-94) by Wichelt Imports. Alternate fabric 16 count White Chocolate Aida (355-94) by Wichelt Imports. 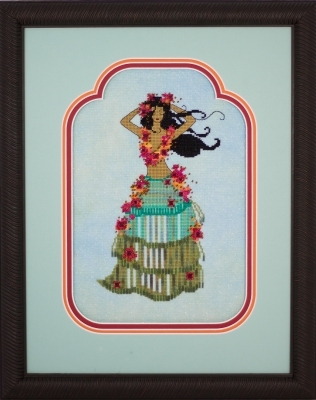 Stitched area is 12″ w x 18.44″ h with a stitch count of 192 x 295. Stitched 2 over 2. The air is filled with excitement and anticipation as Audrey awaits her guests’ arrival on Christmas Day in London. 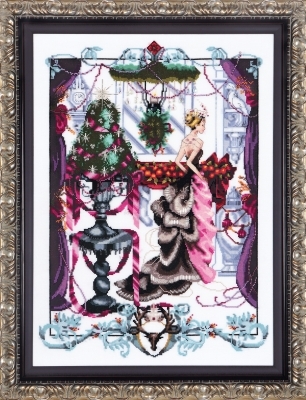 Crafted of rose-pink silk with a smokey-grey taffeta bustle, her dress crackles and shimmers as she moves through the parlor, straightening the stockings on the mantel and the fragrant jewel-toned garlands on the tree. But no one may be more entranced than the children peering from the balustrade above, for they accompanied Audrey on her annual trip to Fortnum and Mason’s to order their Christmas hamper. With their noses pressed against the glorious and decadent shop windows, the first snow falling on their silent wonder, these little ones had no idea that their glamourous mother could make such a posh holiday scene come to life. Soon the bells on the clock tower will chime, and the family will enjoy their Christmas pudding before they open their stockings and gifts. A Happy Christmas to All! The stage is set for the premier of Mozart’s Don Giovanni as an enigmatic woman enters the Metropolitan Opera House, the crowd parting before her as she glides up the lavish red and gold staircase towards the most expensive seats in the house. 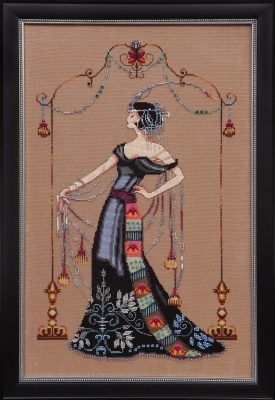 Her blue-black gown glitters with hand-sewn beads in a pattern evoking the creations of Gustav Klimt. Her delicate fingers grasp a jeweled shawl made of precious crystals that catch the light, reflecting her rainbow-hued silk sash. Framed at the entrance of her private box by an elaborate goldwork design, she pauses a moment to take in the sights and sounds of the orchestra tuning before taking her seat behind the curtain. Like an actress who plays many roles over a lifetime, the woman behind the stunning headdress and aloof expression remains a mystery to all. 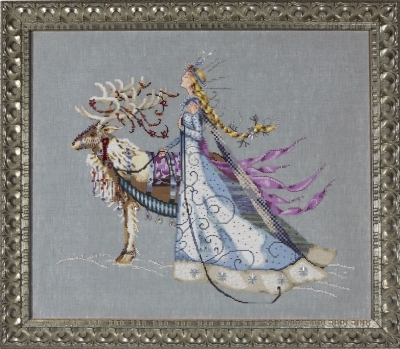 Stitched on 32 count Milk Chocolate Linen (65-95) by Wichelt Imports. Stitched area is 11.13" w x 17.56" h with a stitch count of 178 x 281. Stitched 2 over 2. In honor of her mother who stitched in the palace orchard, Biancabella visits the place where her mother once pricked her finger and made a wish. Her heart’s desire was to be granted a lovely daughter with skin as white as the fragrant snowdrops at her feet, hair as black as the friendly raven who perched above, and lips as red as the crisp apples that hung from the branches around her. 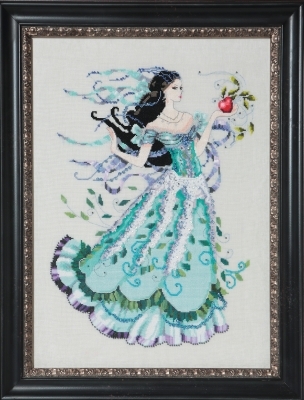 robin’s egg blue gown trimmed with royal purple and embellished with fine ribbons and lace, she holds the last apple of the season aloft, admiring its succulent scent, wondering if it possesses the power to bring her a true love in spring. 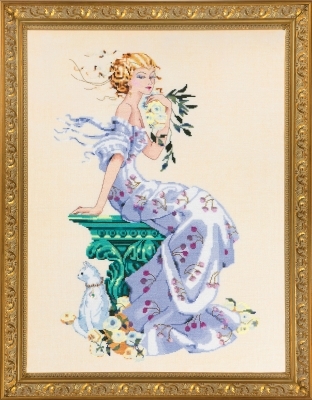 Stitched on 32 count French Lace Linen (65-110) by Wichelt Imports. Stitched area is 11.8" w x 15.7" h with a stitch count of 189 x 251. Stitched 2 over 2. Stitched area is 10.6" w x 15.7" h with a stitch count of 169 x 251. Stitched 2 over 2.